I stayed at this hotel once again after a few years of my last visit. It is still well maintained. 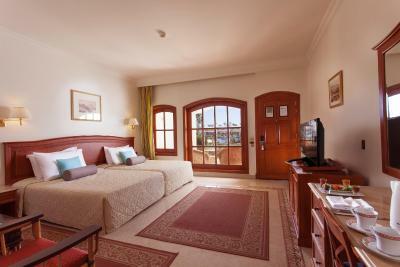 The rooms are huge with a nice balcony. The landscape and pools are amazing. Excellent breakfast buffet. The staff were professional and pleasant. Overall, a perfect holiday spot. The great welcoming especially from Mr. Ibrahiem he is the reception manager. I love when every small issue has a solution. The managers staff was helpufull and kind, but some of the other staff are rude. The room service food is fantastic, the other restaurants in the hotel have a poor menu. The staff are all very friendly, room is very good & restaurant Good & swimming pools very good & room service very good Really, thanks very much for everything. The reception and their attitude to satisfy the guest as it's important when u have a visitor from out of hotel and life guards on the beach always available ,, thanks to all staff and management. The location is great and all the stuff were great specially the restaurant service guys, they were friendly and always smile. 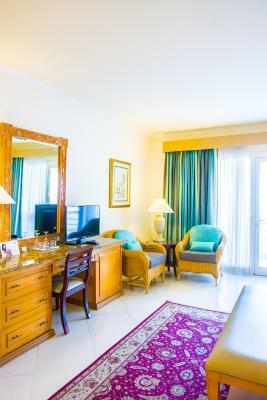 Jolie Ville Golf & Resort This rating is a reflection of how the property compares to the industry standard when it comes to price, facilities and services available. It's based on a self-evaluation by the property. Use this rating to help choose your stay! 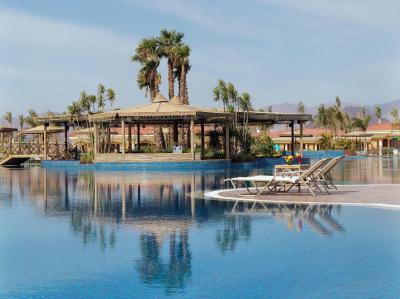 Set on the Red Sea Coast, this 5-star resort features a private beach, an 18-hole golf course, 13 restaurants serving international cuisine and 2 pools with water slides and lazy river. It also features 4 tennis courts. 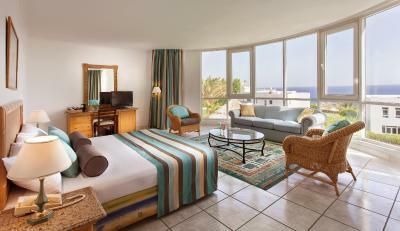 The bright, colorful rooms at Jolie Ville Golf & Resort have tiled flooring and Egyptian-style rugs. They include a private balcony and satellite TV. 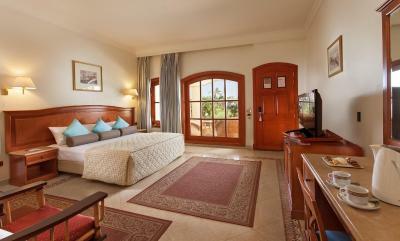 Some rooms have panoramic views of the Red Sea. At the Sushi Lounge, guests can enjoy sashimi and vegetarian dishes. There is also an American-style bistro, and a discotheque for evening entertainment. 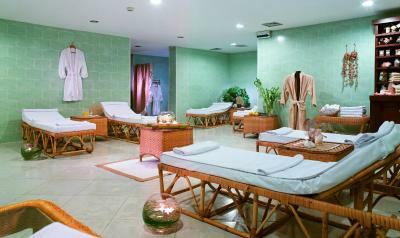 The Jolie Ville has a health club that provides soothing massages, and a gym with cardiovascular equipment. 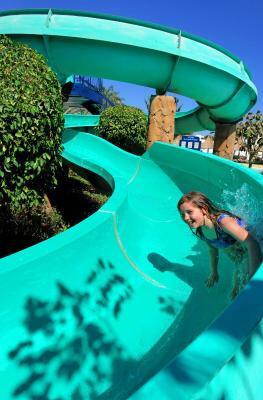 For younger guests, the Jolie Ville Golf & Resort also has a children’s playground filled with fun activities. Wi-Fi can be accessed in public areas at an added fee. 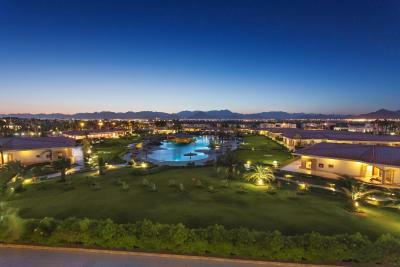 Jolie Ville Golf & Resort is less than 3.1 mi from Sharm El Sheikh International Airport. 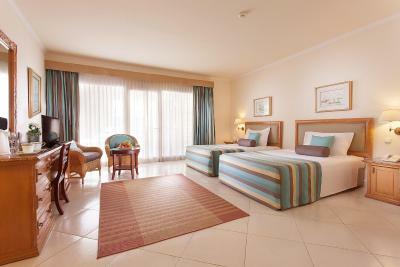 The hotel offers shuttle bus service to Naama Bay for a surcharge. An airport transfer service is available on request. 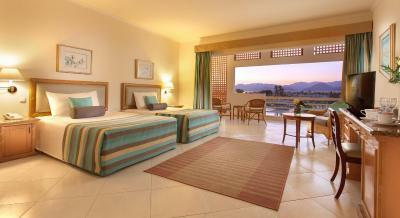 When would you like to stay at Jolie Ville Golf & Resort? 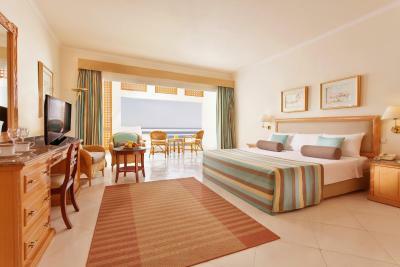 This large room features a spacious balcony with panoramic views of the Red Sea and Tiran Island. 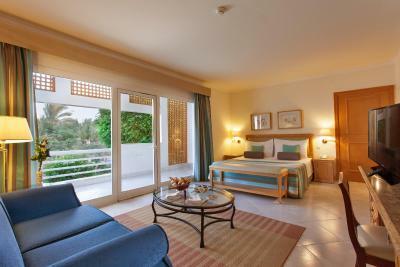 This room has a spacious private terrace with panoramic views of the pool and lush gardens. 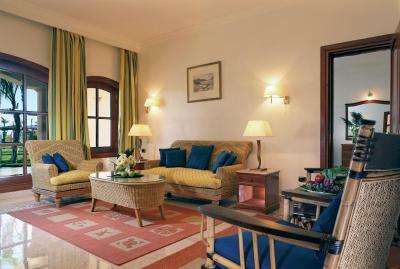 This room has modern furnishings and overlooks the pool and lush grounds. 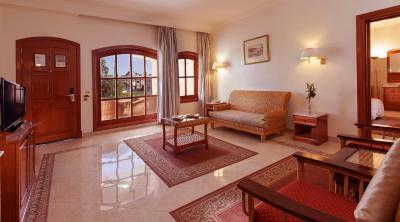 These modern decorated rooms come with a private balcony that looks over the courtyard. 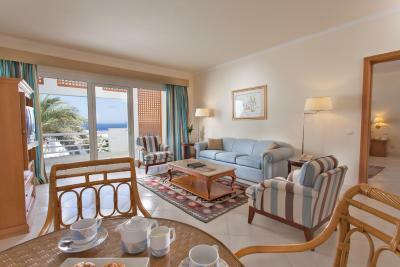 This spacious suite includes one bedroom, a separate sitting area, and kitchenette. 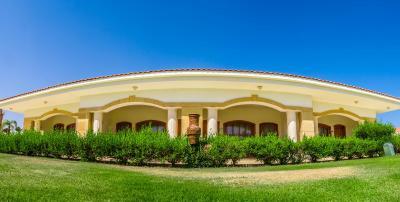 It features panoramic views of the pool or lush grounds. 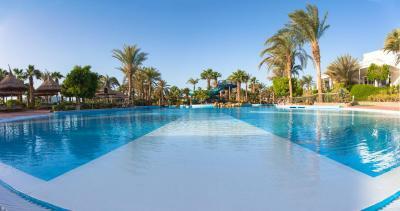 All inclusive does not include Alcoholic drinks. 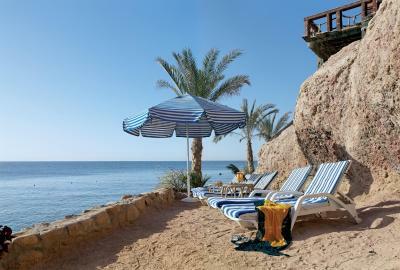 Located on the seashore of the magnificent Red Sea, the two-stories villa has the rooms overlooking the sea or the hotel. 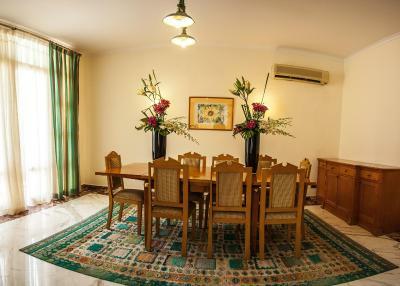 This twin/double room features a electric kettle, satellite TV and air conditioning. 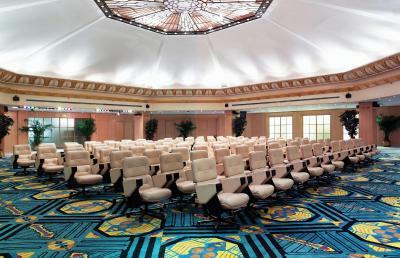 WiFi is available in public areas and costs USD 10 per 24 hours. 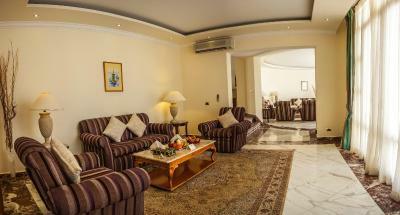 House Rules Jolie Ville Golf & Resort takes special requests – add in the next step! 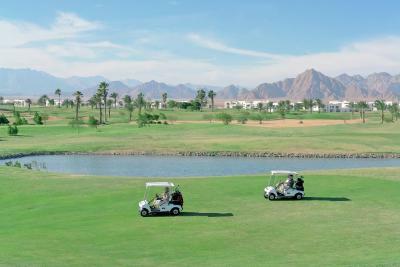 Jolie Ville Golf &amp; Resort accepts these cards and reserves the right to temporarily hold an amount prior to arrival. Jolie Ville Golf & Resort accepts these cards and reserves the right to temporarily hold an amount prior to arrival. New Year Gala Dinner on 31/12/2018, $100 per person (Compulsory). New Year Gala Dinner on 31/12/2018, $50 per Child (Compulsory). They need alot of golf car for guest to carry them from hotel for beach area. 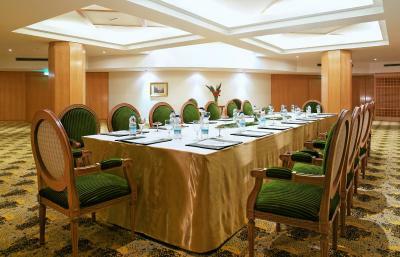 Everything was good,Once we arrived they welcoming us and "Ahmed Yahia" the receptionist was very decent and polite he upgraded our rooms to the royal wings and it was really amazing surprise to us. Totally it was a great stay. Super nice staff, great amenities always well maintained, food delicious. 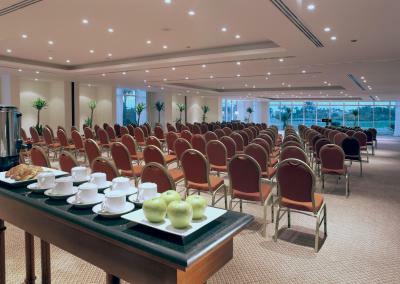 A lot of hard work needs to be done to keep a hotel in such a high standard. Very happy with our Stay. Staff is friensly and there is a great amount of activities to do around. Room was big and food was great. Definitely recommend. The food is very bad, room not as big as anticipated. Great hotel, great staff, absolutely delicious food! Beach is beautiful, perfect for snorkeling and diving. We are definitely coming back!